One of the things I regret the most from my recent trip to Oaxaca is that I didn’t attend cooking school while I was there. I had picked out Casa Crespo because the it was a drop-in class that seemed to look like private lessons whenever I walked by. 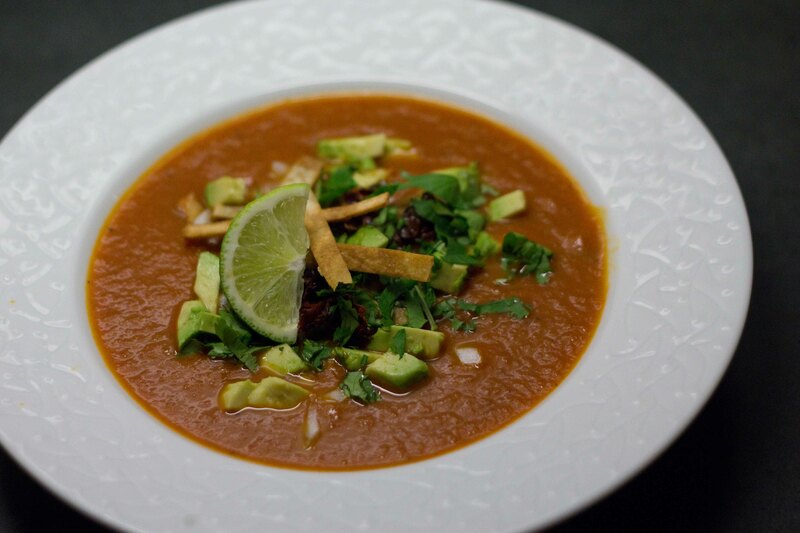 You were also able you were able to make requests for the menu, and I had decided I was going to request to make Sopa de Azteca, (tortilla soup). Unfortunately I got a case of “bad stomach” the night before my cooking class, (beware of un-chilled mayonnaise from a Costco sized container) and I didn’t get to go. Diana Kennedy – aka the Julia Child of Mexican cooking. Rick Bayless – Top Chef Masters winner and known for his true Mexican food that’s user-friendly to Americans, (although my Oaxacan travel partners “poo-poo” Bayless’ authenticity). Recipe from De La Tierra cooking school in Oaxaca and one of the places I looked at taking a class at. I took what I liked from each recipe to create my own. There are no short-cuts in the recipe that follows, in fact, I added a lot of extra steps in hopes of building a good depth of flavour in the soup. I started by slowly simmering a liter of pre-made chicken stock in a pot with 3 skinless chicken legs. In a baking dish, I added a few fresh tomatoes and drained canned tomatoes and put them under the broiler. I poured vegetable oil into my trusty Dutch Oven to about an inch depth and heated over high. I’m not much of a deep fryer, but what’s a tortilla soup without crisp tortillas? Corn tortillas are cut into strips and fried about 20 seconds a side. Precious Pasillas de Oaxaca, (my secret stash), fried 5 seconds a side. I drained most of the oil from the dutch oven and added chopped onions and some garlic to the pot and sautéed until they were very soft. To a blender, I added the broiled tomatoes, 2 pasilla chiles, (cored & deseeded), the onions and the garlic and whizzed until smooth. 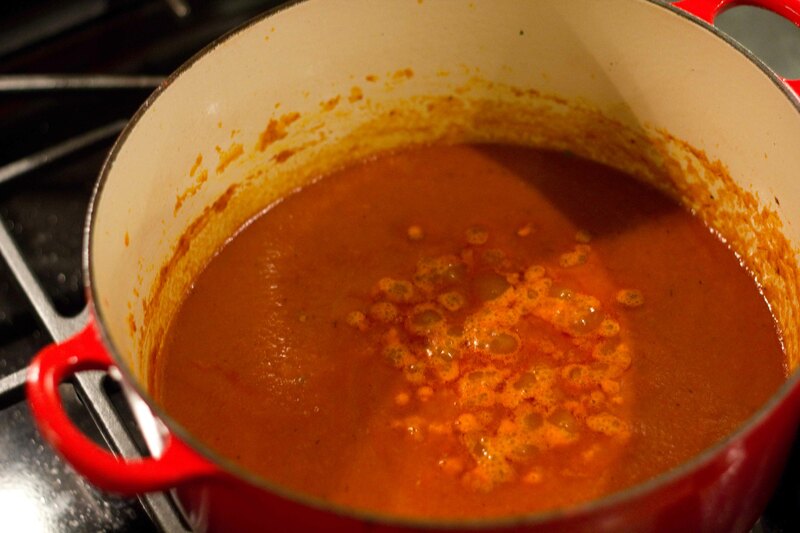 I heated the pot again with a bit of the reserved oil and poured in the tomato mixture. This mixture bubbled away until reduced by a half. I added a liter of the chicken stock to the pot and let the soup simmer away. I like to let my soups sit, to develop flavours, so I made this in the morning, so it’d be delicious in time for dinner. Right before dinner, I prepped the accessories for the soup. 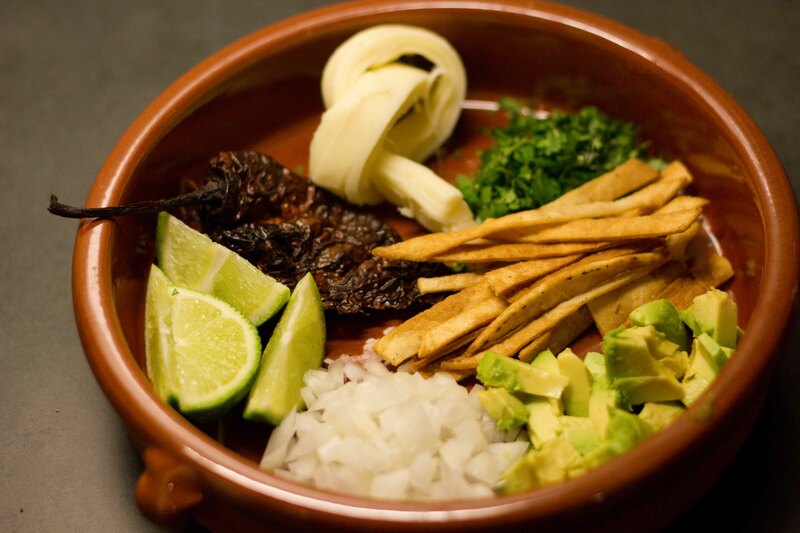 Starting at 12:00 – Oaxacan string cheese, cilantro, tortilla strips, avocado, onion, lime and pasilla chiles. I reheated the soup and let it bubble away again. I added more chicken stock to reach my desired consistency. I was happy that my soup had developed a lot of flavour. My only mis-step was that I added 2 chiles to the soup before I blended it. I should have put in one and then more could have been added to the soup when served to taste. I’m not sure if all of the extra steps made the soup better or not, but the finished product was MUY SABROSO! 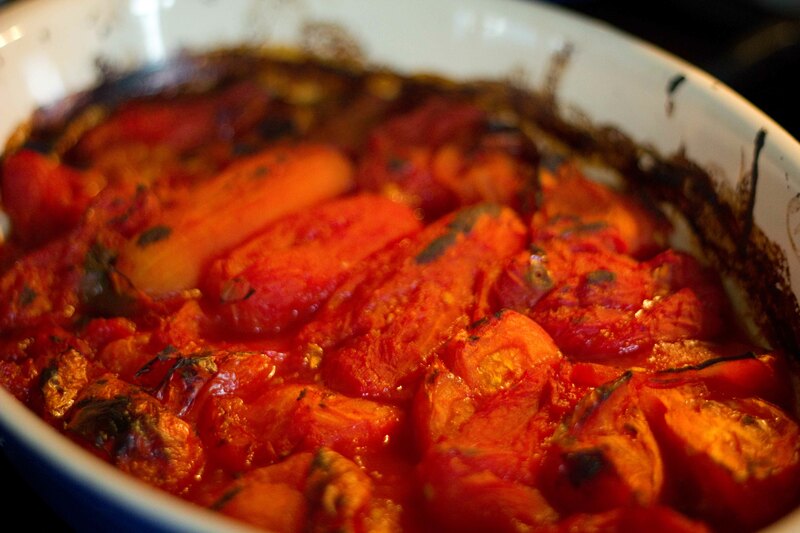 Drain canned tomatoes and put into baking dish with quartered fresh tomatoes. Broil on high until there’s colour on all sides of the tomatoes. Add chicken legs to chicken stock and simmer for 30 minutes. Take out chicken legs, and reserve meat for use later. Heat vegetable oil on high in a dutch oven. 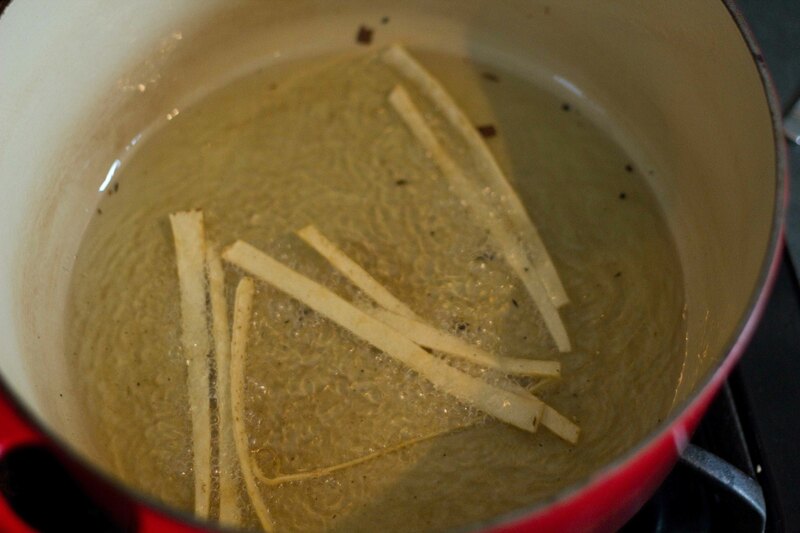 Cut tortillas into thin strips, fry until lightly golden coloured. 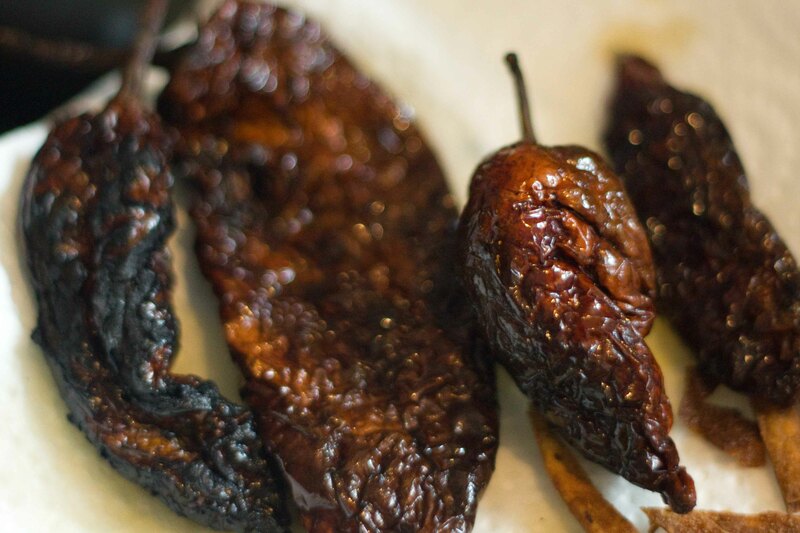 Quickly fry chiles until they’ve puffed up, 5 seconds per side. Drain and reserve most of the oil from frying. Add onions and garlic and saute until soft, around 10 minutes. Add onions, tomatoes and 1 chile to a blender and whiz until smooth. Heat Dutch oven with some reserved oil, add tomato mixture and simmer until reduced by half. Add 1 liter of chicken stock and simmer for at least 30 minutes. 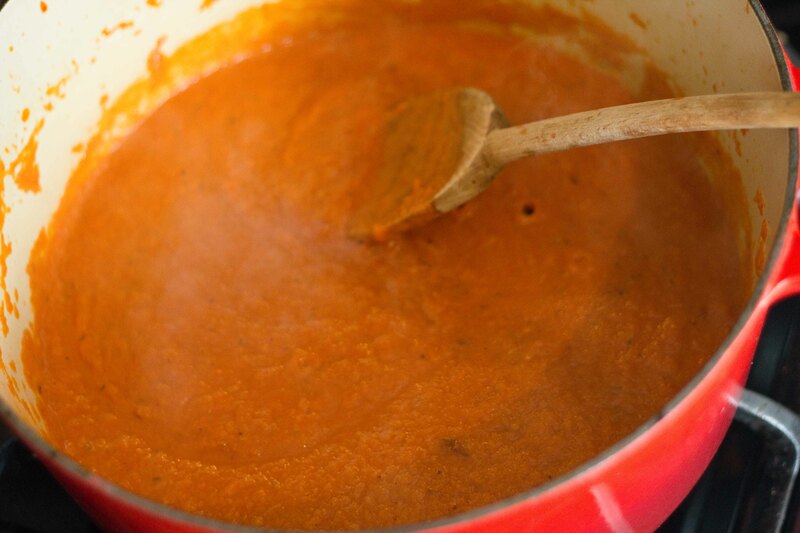 When it comes time to serve the soup, add more chicken stock to bring soup to your desired consistency.